I’m old. It’s not the 13 kids that make me feel that way. It’s not the 3 grandkids. It’s not the gray hair on my temples that my barber can no longer trim away. It’s not even the number of Advil I have to pop after hiking with my kids in our beautiful Wasatch Mountains. It’s every Tuesday and Friday morning from 6:00AM to 7:20. I get up as quietly as possible in the dark to avoid waking my lovely wife. I dress in shorts, a t-shirt with the arms cut off and sandles with socks and drive about a mile to the LDS church. 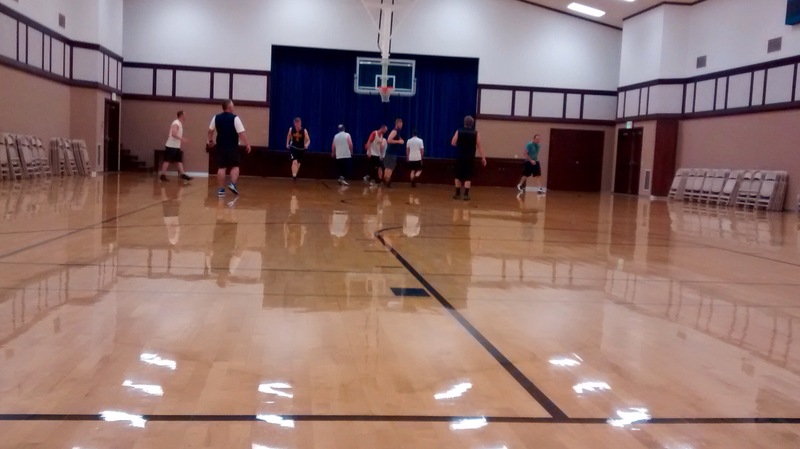 There I put on my shoes and run up and down the court for 80 minutes chasing a round leather ball. I’m still moving the same speed I always did. It’s the guys around me seem to be moving in fast forward mode. Now, part of it may be that I am really am old. Looking around at the other 12 guys, all but one are younger, faster and in better shape. Jeff, the one guy 14 years older than me isn’t actually a real person. I’m pretty sure that he’s an android. But, there are only 5 players per team, so what about those extra three? Well, every gym has house rules. Sometimes, the extra guys wait and get to play the next game. 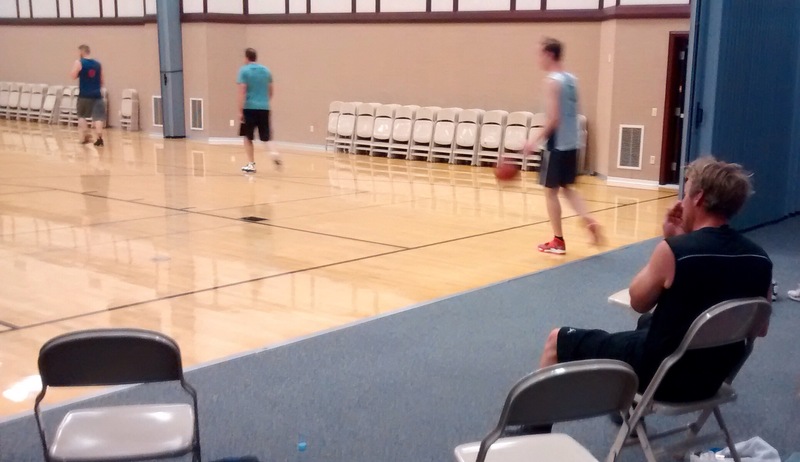 Our rule though is that we typically use them to substitute for people on the court. These are just pick-up games, so there are no coaches, no defined teams, you call your own fouls and the players on the court decide when to sub out. This system works well. . . if everyone is willing to not play. Generally, a team will have a rotation. I subbed out for Chris. Mark subbed out for me. Jay subbed out and let Mark back in. Andrew sat down to let Jay back in. It was back to Chris’ turn, so he sat to let Andrew back in. At this point, I should notice that Chris is sitting on the bench and after he’s been out a couple minutes, I should call for him to come in for me. They system works well if everyone is willing to sit. It means you might end up sitting for two or three minutes out of every 15. But, what happens if the system breaks down? Suppose I just ignore Chris? Suppose I decide I want to keep playing and make Chris wait on the bench for 5 minutes? Or seven? Well, now Chris feels like he got shorted, so when it’s his turn to come out for Andrew, he makes Andrew wait longer. Andrew, in turn now feels slighted. Worse yet, is if someone just skips their turn to sit out. Now, the rotation is screwed up and the guys on the court don’t know who should sit down. Eventually someone decides to sit even though it’s not their turn. The guy on the bench is frustrated, the guy subbing out is frustrated. We see a similar situation when two lanes of traffic have to merge. If everyone takes turns, alternating one car from the first lane and then one car from the second, everyone moves along at the same slow, but consistent pace. But, what about when that guy in lane one decides he isn’t going to let the guy in lane two merge in front of him? He creeps up on the bumper of the car in front of him to seal the gap. Now, the guy in lane two is trying to decide to press it, or drop back. He’s frustrated. The guy in lane one is frustrated. The guy behind him in lane one is frustrated because he knows that the guy in lane two and the guy behind him are both going to want to merge in. We have these situations in business as well. I’m on call 24×7 on my job. I really don’t have a backup. I work with other teams that are also on call, but typically they have multiple people who share the on call duty. Often teams will formally assign the on call person. But, I work with one team that does not. And they are by far, the most pleasant team to work with. Their “on call” solution is that they have a single on call number that rings to everybody’s phone. When the on call phone rings, whoever can get it first, gets it. Even after hours, in the middle of the night, they share the pain. Now, imagine that they had a team member who refused to answer the on call phone. The rest of the team would start to resent it. Perhaps they would even stop answering the phone as quickly if they knew the one lagging team member was available, just to put him on the spot. The team would be frustrated, the laggard would be frustrated, the customers calling them would be frustrated. I think that is what seperates “teams” from a group of individuals. Teams step up and sacrifice for each other. They are willing to “take one for the team” whether that is answering the phone at 2:00 am or subbing out of a basketball game. Just some random thoughts as I was waiting WAY too long to sub back into the game.